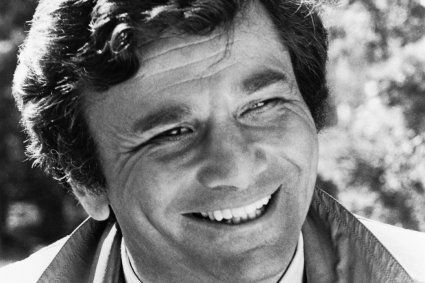 Notable for being the only episode directed by Peter Falk, Blueprint for Murder really put its central star through his paces – both in front of and behind the camera. With a challenging real-life construction environment as a filming backdrop and some big name co-stars to performance manage, Falk nevertheless managed to pull a rabbit out of a hat with a rock-solid directorial debut. 5. Bo goes berserk – Texan style! Viewers get a whirlwind introduction to soon-to-be-victim Bo Williamson from the get-go, where his cowboy-booted feet are amongst the first things we see during the opening credits. In typical volatile Texan style, big Bo wears his heart on his sleeve and when he finds out that Markham is forging ahead with plans to build Williamson City using Bo’s money to bankroll it, he goes BERSERK! First, he trashes the scale model of Williamson City in Markham’s plush office, then screeches across town in his Cadillac to confront the conniving architect at the construction site. A blazing altercation ensues in which Markham refers to Bo as ‘a Philistine’ and hints he’d like to see him dead. Bo responds by condescendingly slapping Markham’s face as he hurled taunts back. It’s an unforgettable intro for blustering Bo, which tells the viewer everything they need to know about him and his disparity from the urbane Markham in a highly efficient manner. If there’s a downside to this it’s that Bo’s feeble surrender to the gun-toting Markham later in the episode seems disappointingly out of character. As his half-hearted fellow officers shuffle impatiently outside, Lieutenant Columbo is already unraveling the mystery as he sits in Bo Williamson’s abandoned car at the airport. Columbo might as well be a million miles away from the other cops as he sits in a world of his own with classical music pumping out of the car radio speakers at high volume. But he’s not just digging the vibes – he’s puzzling out a mystery. The lightbulb moment isn’t far away as the Lieutenant notes that all the cassette tapes (Google it, millennial readers!) are country music. So why is the radio tuned into a classical station if Bo was thought to be driving? It becomes Columbo’s big reason to suspect foul play – especially when he uncovers Markham’s love of classical music a short while later. This scene is so good because it shows us just how astute Columbo is. He picks up on the little things others miss and is a superior mind in every regard. When Columbo seeks information on just how you go about digging up the pile of a building he earns a one-way ticket to administrative hell – with real-time queueing all part of the process. The boredom and thanklessness of both working in such an environment and having to negotiate one’s way through it as outsider could be painful viewing, but is salvaged splendidly by Falk’s excellent comic performance. His slumping shoulders and resigned expressions are perfect in summing up the tedium of his assignment – and how he resisted leaping over the counter to shake the officious Government jobsworth by the lapels represents magnificent self-control by the harried detective. Eagle-eyed viewers may also notice Columbo stalwart Mike Lally in one of his many cameo appearances as a fellow queuer. Goldie is one of the great Columbo support characters and her introduction to viewers is even more enjoyable than that of her former husband. When Columbo first meets Mrs Bo Williamson V1.0 she’s partially clothed on a masseuse’s table – leading, predictably, to much eye-averting embarrassment from the abashed Lieutenant. The sassy Goldie goes on to become a key ally for Columbo as he cracks the case, and in terms of casting the show creators got it so right! It’s a first-class performance from Janis Paige, who believably makes Goldie the type of woman who could easily stand up to Bo Williamson’s bluster. She was delivering Girl Power years before Charlie’s Angels even aired. A chirpy Markham is racing to the construction site with Bo Williamson’s long-dead body in his trunk when he runs into trouble. A blown tyre leaves him narrowly avoiding a nasty smash, but just when he thinks he’s gotten away with it a traffic cop pulls up behind him. After congratulating Markham on his fine driving skillz, the cop then invites him to open the dead-body-filled trunk to help replace the tyre. Markham freezes, but, thinking fast, comes up with an excuse: his spare tyre is flat, too, and he’s been meaning to get it filled up. The affable law enforcer then rides off, promising to send a repair truck, and Markham is back in business after one hell of a close shave. It’s a scene of superior tension – and one that was actually originally planned for Murder by the Book (also written by Stephen Bochco), but was cut for timing reasons. It’s great to see that it wasn’t lost to history. At the risk of sounding like a scratched record, as always I’d love to hear your views on your highlights of this particular episode. If you’ve got a hankering for a more in-depth exploration then read my full episode review here. Tags: Blueprint for Murder, Bo Williamson, Elliot Markham, Goldie, Janis Paige, Patrick O'Neal. Bookmark the permalink. And I value the high level of professionalism and knowledge of the bureau stuff, esp. the man who ate the sandwich till 13. Standart type? 4 tonnes? and fluency he checked out all the rules. He really Knew! No quarrel with your choices, but the final scene deserves at least an honorable mention — as no Columbo villain was caught as red-handed as Elliot Markham. I always had a soft spot for that big galoot, Bo. I’ve worked offshore in the United States and met plenty of guys like him. Our good architect is fortunate that Columbo wasn’t investigating his murder, not Bo’s, for fooling around with his money and his wife. Hard to work for but when the ship come’s in, they pay for everyone’s ride. Forrest Tucker played a guy like that to a T! Thanks for your great posts, they lighten my day to read them. Aw shucks, thanks a trillion! Usually I like slow-moving Columbo episodes, but this one was a bit too slow even for me. I’ve only watched it once, perhaps I should give it another try. The ending was pretty good though. I’m both a horse lover and a fan of this episode, so I’d include Bo at the racetrack as one of its top 5… or top 20 moments – because this is actually one of my very favorite episodes if not the best one – I’ll vote when I watch them all, though (I’m currently going through the new ones). These are great choices for good scenes. I really enjoyed this post as well as the full write up of the episode. BTW, I hope you’ll start doing some more reviews. I’m stalling viewing “Publish or Perish” until your episode review is published. I’m sure it’s a lot of work to publish your reviews, but if you want to consider publishing a “rough draft” before everything is perfect, that would be cool! Thanks again for this excellent blog. I enjoy getting your insights on the episodes. Thanks very much for your kind words! It’s always pleasing to hear that people are enjoying the blog. Rest assured Publish or Perish is close! I’ve done draft 1 but need to rewatch this week and then finalise. Hopefully it’ll be worth waiting for, as it’s an episode I really enjoy! Every blog you write is enjoyable, but I’m especially looking forward to the next one. Before reading your “5 Best Moments” I guess which five you’ll select, and went 4/5 this time. Instead of the queue sequence I guessed that you’d include the scene after Markham’s lecture when Columbo assists with cleaning the chalk board. Admittedly that is a good scene, however I felt that overall it felt a bit conveniently shoehorned in to plant the idea of burying a body in building foundations. I am quite fond of the literally “caught in the headlights” gotcha moment. Great list as always! Not much to say about your choices — they are great. I wouldn’t change them. I love this Columbo movie because we see more small human reactions — the effect an actor’s director undoubtedly, like Goldie kind on consoling Columbo with a few good words in her own style after the police’s failure at the construction site. This is something we also find in “It’s all in the game” which Peter Falk didn’t direct but wrote. It says so much about who it was.